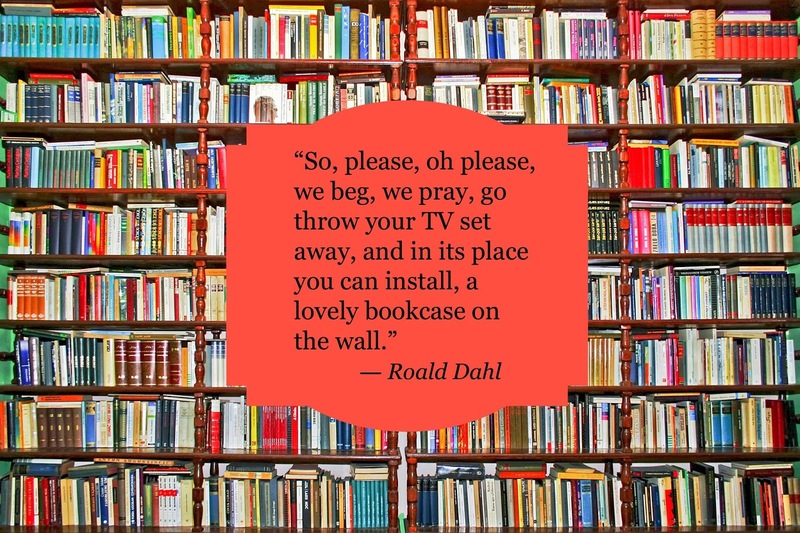 Books Anonymous: Ditch the TV, install a bookcase! As I write, the TV here is actually on - an afternoon screening of The Jazz Singer was too hard to resist. However, I can live without TV on the whole. There are odd things I particularly enjoy, and I can be disappointed if I miss them. But, the combo of an aging TV and temperamental T-box, plus being in a black hole for TV reception, means that we're down to the ABC, SBS and Nine networks - no Seven or Ten - which knocks out a third of the commercial free-to-air channels available in Sydney. Does this worry me? Well, no, not really. DB and Seventeen get peeved about it, being great watchers of commercial TV over the alternatives. DB, to his credit, does enjoy the documentaries and series that he's watching with me on the ABC and SBS now that there are fewer alternatives, but more often, Seventeen just heads of to his room and watches movies on his laptop instead. I look back to my childhood and remember very little TV viewing time. My mother was a real dragon in that respect. I grew up largely ignorant of commercial TV, and it's only now, with re-runs of old shows that I'm seeing most of them for the first time - which amazes DB! Having said that, Mum would sit us down in front of all sorts of carefully chosen programs, and I remember rolling around the floor laughing at the antics of people like Buster Keaton, and Laurel and Hardy, in old silent movies in black and white, nature programs, and documentaries about all sorts of things. The only American TV I saw as a child was Sesame Street, which had just come to Australia. However, we weren't bored. The TV just wasn't a big part of our lives. Books were - there were always books. We had our own books, which were continually added to at birthdays and other gift giving times. There was the weekly visit to the public library. And there were school libraries. To this day, I find it hard to understand how people can just sit passively in front of the box watching things they aren't particularly interested in... For myself, if what's on doesn't interest me, I'll go pick up a book. 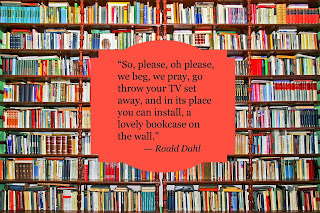 Often, if I'm trawling my own bookcases, I'll have to answer, yet again, how it is that I can read the same book over again - the question often posed by one of my menfolk who are watching an episode of Two and a Half Men, Seinfeld, or some other inane sitcom for the umpteen millionth time! A book, no matter how many times I read it, always offers up something new each time I read it. A new book, of course, is a whole new adventure. So, my challenge to all my book junkie friends is to book bomb any TV watching zombies in your families! There are all sorts of subversive ways to get people reading - Seventeen read I, Iago in the week he was away in January - spurred on by his affinity with the character from studying Othello last year, and his curiosity about what another writer had done with him. DB is currently reading The Life of Pi. I gave them those books...so if I've guilted them into it because they feel they should read them...so be it! Our house now has books all over the place, and they're not all mine any more. It feels great! As a junior secondary English teacher, as well as my own books I read many aimed at people my students' age. I just finished reading R.J. Palacio's Wonder. It is beautiful and has wonderful messages for adults and children alike. I saw it described somewhere as 'a meditation on kindness' and it is just that. Hoping to be able to read it with my class this year - they would benefit hugely! And I can say I've never felt more bored and depressed than sitting in front of the screen watching for the sake of watching! It's one of my pet hates... There are movies I'll rewatch, the same way I re-read books. Otherwise, TV is such an ephemeral thing, and generally a single watching of most things is enough. Nothing feels quite so desperately futile as watching something just for something to do! I like watching TV but like you, I could live without it. My parents sit in front of their TV all evening (I will watch one show then go and do something else), I've tried and failed to get them reading! I think that people can develop something of a dependency on TV over time. That auto-pilot thing of just walking through the door and turning it on without thinking and watching whatever is showing simply because it's there... I watched it with my father, and I see it with so many young people.